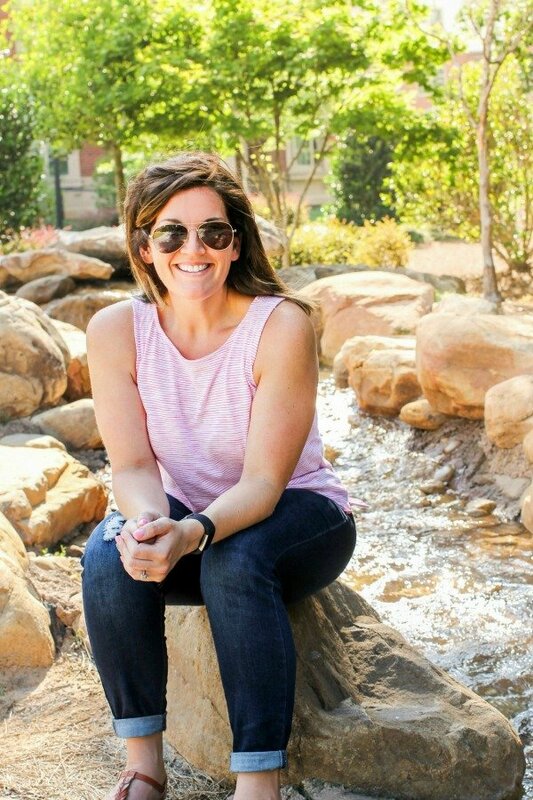 April 27, 2016 By Allyson Leave a Comment This post may contain affiliate links. Read my disclosure policy. 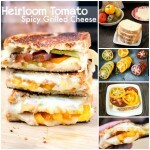 Heirloom Tomato Spicy Grilled Cheese is the perfect ooey-gooey sandwich! 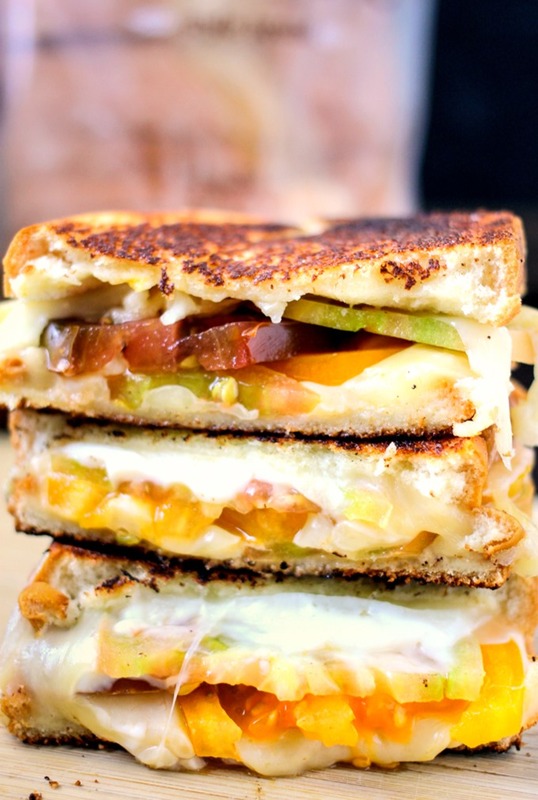 Grilled Cheese. Enough said, right? 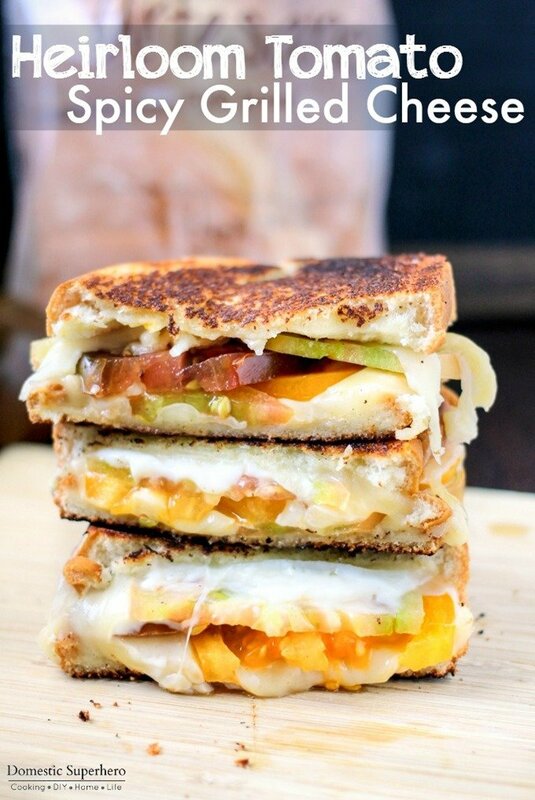 I am a major grilled cheese-aholic, and this Heirloom Tomato Spicy Grilled Cheese is out of this world! 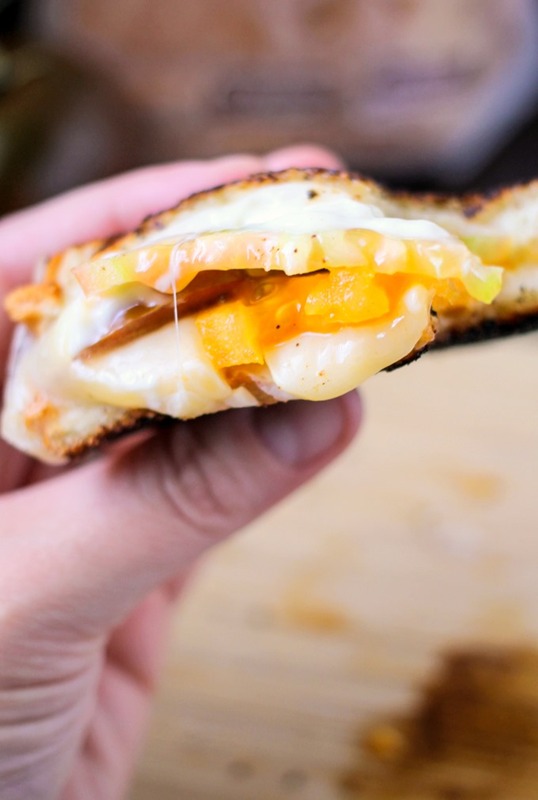 Did you know that April is National Grilled Cheese month? They have a specific day too, April 12th, but that’s already passed us by. Since I missed it, I just chose to celebrate the whole month. 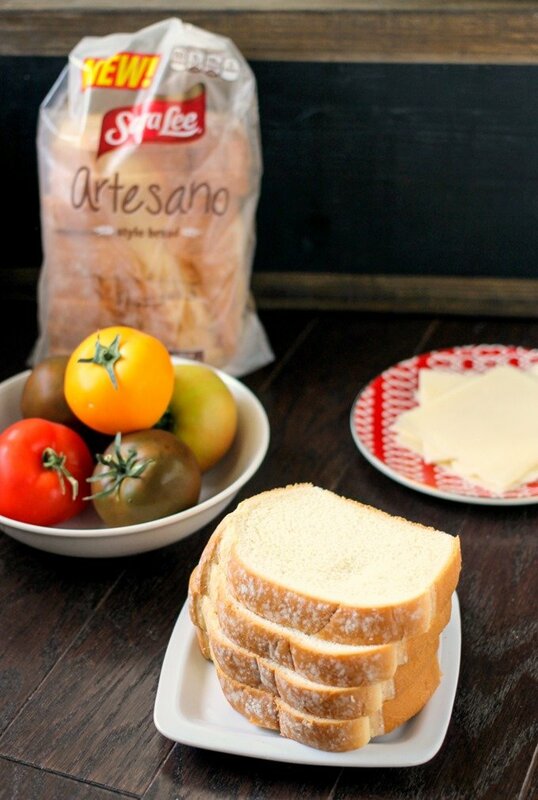 This sandwich is full of delicious heirloom tomatoes, 2 different cheese, and a spicy horseradish spread, all stuffed and melted between two delicious slices of Sara Lee® Artesano™ Bread. You must try this. Right now. Since I have become so obsessed with this bread, Sara Lee has kindly sponsored this post, but all opinions are my own. Another one of the reasons this sandwich is so delicious, is the creamy horseradish spread. I simply mix mayo and horseradish, and BOOM, you have an awesome creamy yet spicy sauce. Don’t like spicy food? No problem, don’t use the sauce. Using mayo would also produce a creamy sauce, but you can leave it out all together if you prefer. The heirloom tomatoes pack a bold fresh tomato flavor, and then two cheeses, Havarti and Cheddar, compliment the other ingredients perfectly, and pair for a great melted cheesy sandwich. One tip on making the perfect grilled cheese: Do not cook on too high of heat. 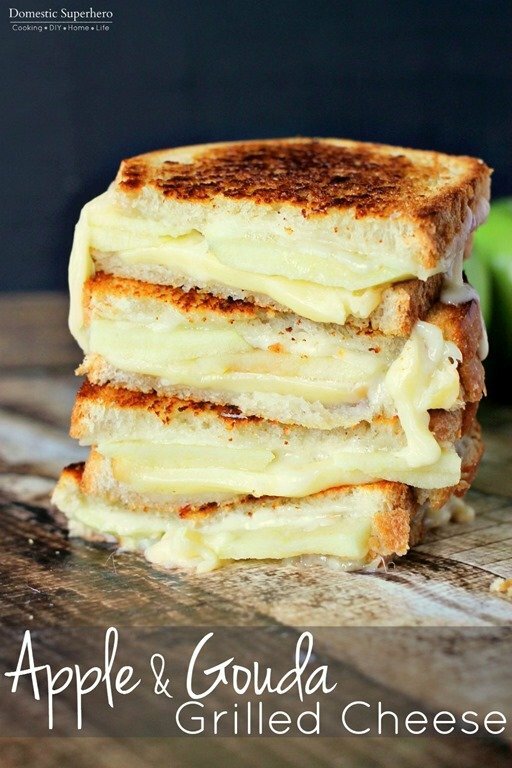 You want to cook at a medium heat, so that the cheese has time to melt and the bread does not burn. Do not turn up your heat too high, or else you will end up with burnt bread and hard cheese…not good. Also, butter the outsides of your bread! This helps the bread get a nice golden crunch. Trust me. Dig in and enjoy! The recipe below is for 2 sandwiches, but can easily be tailored to fit how many sandwiches you want to cook! In a small bowl mix mayo and horseradish, set aside. Assemble sandwiches: On one side of bread, spread some butter, flip slice over and add 1 slice Havarti, 4-5 tomato slices, 1 slice of cheddar. Then smear the horseradish spread over one side of the remaining bread slice, and close the sandwich with the spread facing the cheese. Then, spread some more butter on the top of the slice. Repeat for second sandwich. Heat a large skillet over medium heat. Add both sandwiches to the skillet, and cook for 3-4 minutes on the first side (watch closely for it to turn golden brown), then carefully flip sandwiches, and cook for 2-3 more minutes on the second side (this side will cook faster). Remove from skillet and cut in half. Serve immediately. If you don't enjoy spicy sandwiches (this isn't THAT spicy), you could leave the horseradish out. You could also add more, if you like things very spicy. 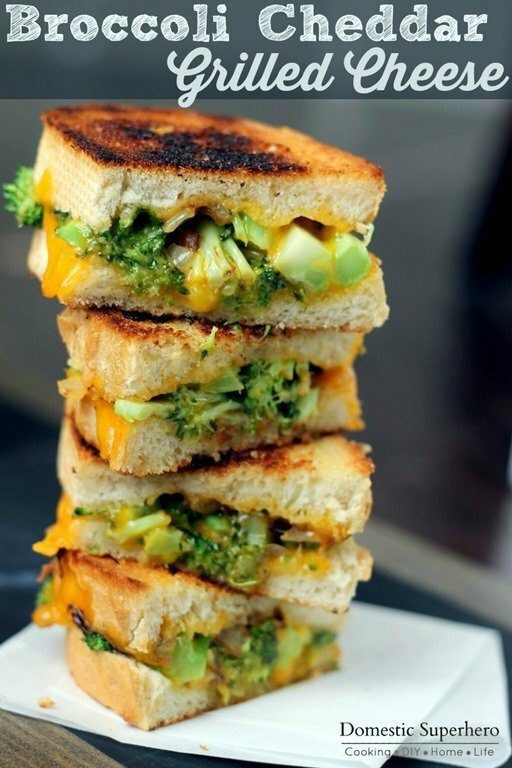 Like grilled cheese as much as I do? 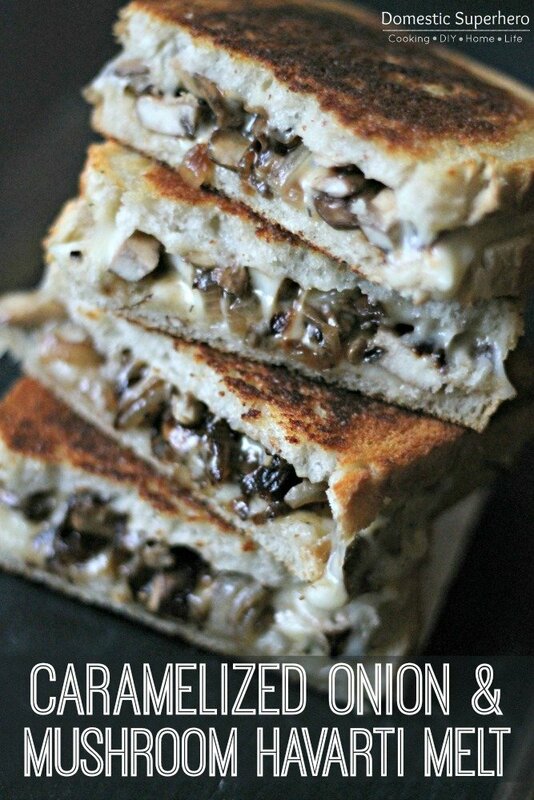 Check out these other posts- click on photo for recipe!